This is a remarkably large and lavishly illuminated Book of Hours, combining French and English styles. The first leaf contains a list of obits members of the royal family and of the 4th, 5th, and 6th Earls of Ormond and their wives, so it was probably made for Anne Boleyn's grandfather, Thomas Butler (1426-1515), 7th Earl of Ormond, or a member of his family. It was given in the early 16th century to a chapel at 'Suthwyke', probably Southwick in Hampshire. 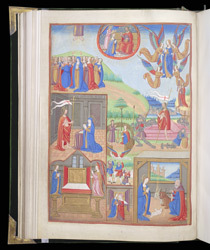 With no clear rationale for the selection of scenes or their arrangement, this miniature, the left-hand side of a double-page scheme, includes the Annunciation, Visitation, Annunciation to the Shepherds, Nativity, and the Ascension and Coronation of the Virgin, as well as the Resurrection of Christ, his Appearance to Mary Magdalene and to the Virgin, and his Ascension.